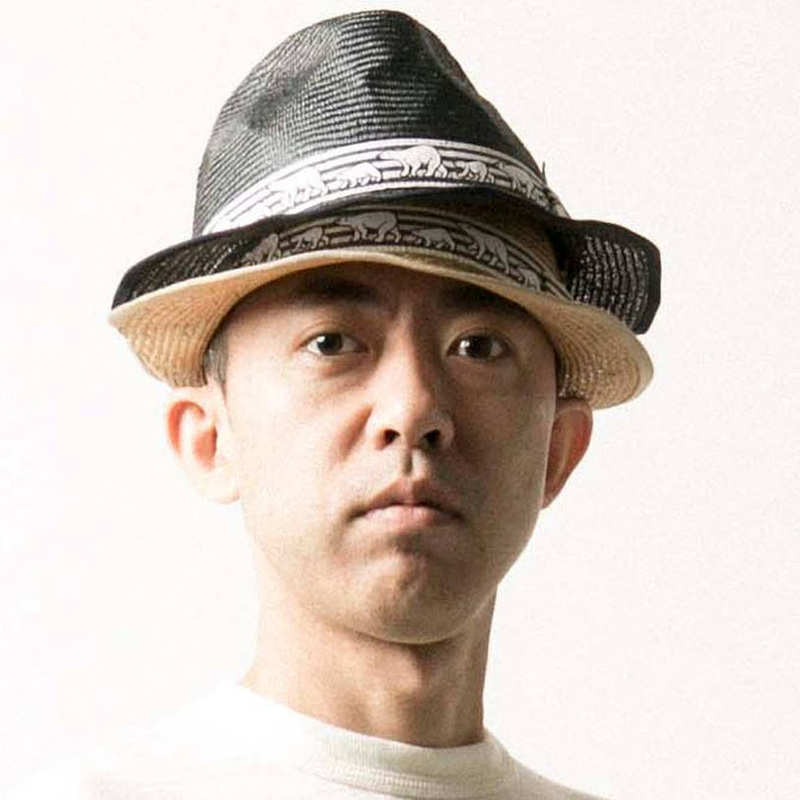 Tomoaki Nagao, also known as Nigo is a Japanese fashion designer and founder of A Bathing Ape (BAPE) and BAPESTA. He was also formerly creative director of Uniqlo’s UT division, focusing on graphic T-shirts. He also co-founded Nowhere with mentor Jun Takahashi, Billionaire Boys Club and Ice Cream with Pharrell Williams. He has since left Bape but still collaborates with Pharrell and runs his own streetwear brand Human Made as well as numerous other businesses. Known as a collector of all things, Nigo is well known for being one of the largest Star Wars memorabilia in the world. And also for his collection of watches. We spot two for our article today from Cartier and Audemars Piguet. Nigo’s love of life is legendary. The designer had a weak spot for collecting. From genres as varied by the likes of pop art icons like Warhol, Futura, and rare toys from Star Wars to Astro Boy, he was a true cult obsessive. More on Nigo this YouTube video for background info on this interesting person. Nigo, from his now defunct (last update 2014) Facebook page. 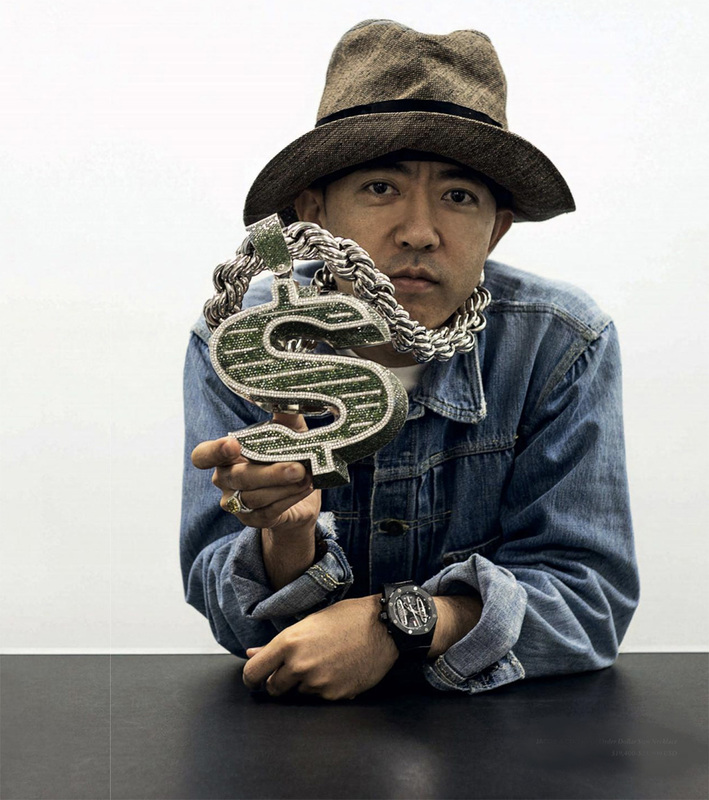 He put up some of his collection for sale at the Sotheby’s auction: Nigo Only Lives Twice where 107 lots were offered for sale. Including two Richard Milles, one of which is a piece unique in white gold, diamond encrusted tourbillon, three Franck Mullers including a minute repeater, a Girard Perregaux tourbillon, a Jacob & Co and a Roger Dubuis tourbillon. The first watch we want to highlight is a now discontinued Cartier Tank Française Mid-Size with full diamond encrusted case and bracelet and a pave diamond dial. The current Cartier Tank Française collection is a ladies series and smaller than the mid-sized one we see in the photograph below. In a GQ Japan. interview photo session, Nigo in his house. 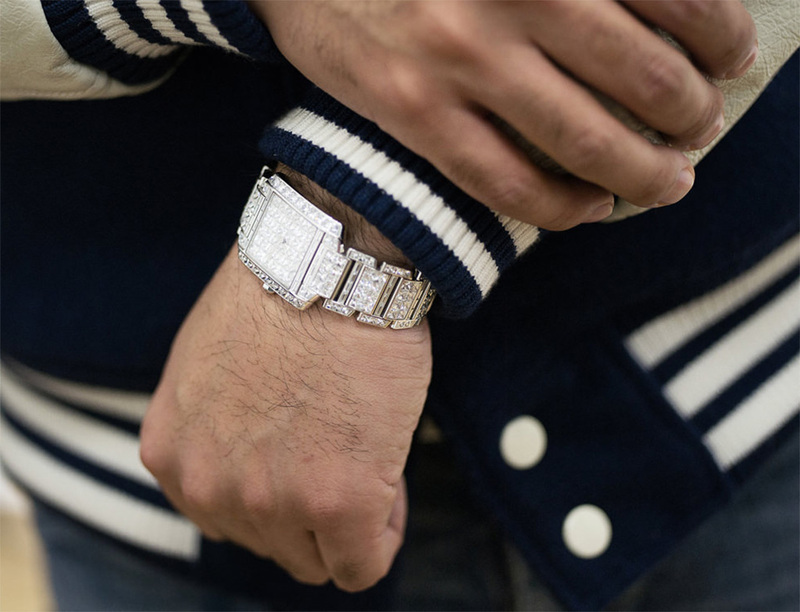 Hidden under his sleeve is the Cartier Tank Française..
Another closer photograph shows the sleeve pulled up slightly to reveal the diamond encrusted watch. The mid size Tank Française in full diamonds with a diamond pave dial. The line is currently only contains ladies models. Photo from GQ Japan. 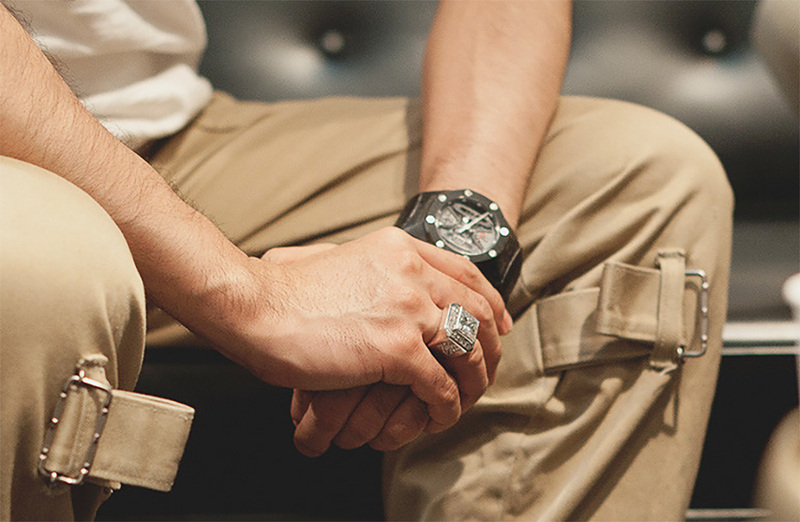 He has also been known to sport the Audemars Piguet Royal Oak Carbone Concept. This is a concept case AP with a carbon case, and features a power reserve, selection indicator, chronograph and tourbillon. Manual wind, AP Caliber 2895. A closer up look at the AP Royal Oak Carbone Concept. This concludes this episode of Spot the Watch.